I would like to share a little someone with you all. Here goes........ I have a fondness for mannequins. I know that probably sounds odd, but allow me to explain. I grew up in a tiny wooded suburb in Washington State. When I was 10, my 16 year old brother who had a restaurant job at the mall in town found a female display mannequin in that mall's dumpster area when he was taking the trash out one night. She could have been from Sears, JCPenneys, Montgomery Ward, or any other highly fashionable woman's store. My brother stuffed the mannequin into his car and brought her home. It was like Christmas morning when he came in the house that evening with the mannequin. I can't explain my attraction other than it was like he had brought a life size Barbie Doll home. My brother was in a band and he'd put that mannequin on stage when they were performing. That went on for a year or so. At some point though, he lost interest in the mannequin and left her in the family room to gather dust. That's when I took over. Step one. I named her Jennifer. I would dress her in my Mom's swimming suit with a life vest on and put her in the shower with the curtain closed. I'd eagerly wait for one of my sister's to take a shower and listen for them to scream when they discovered Jennifer. Remember, I grew up in a little town with not much to do. I'd also dress Jennifer in a night gown and place her in my parent's bed or put my Planet of the Apes mask on her and stick her in someone's closet. That went on for a while. No one seemed to enjoy my hijinks except me. Step two. I took it up a notch. I began putting makeup on her and outfitting her up in more dramatic attire. I'd dress Jennifer like Marilyn Monroe, Michael Jackson, Boy George............. She became a part of the family in some way. A sister would ask, "I'm done with this lipstick. Would Jennifer like it?" or "I don't want this tube top, can I give it to Jennifer?" The answer, of course, would always be yes. I could go on and on about Jennifer. I took a ton of photos of her various outfits but when I was 17 I went through a period when I tried to "straighten up" and threw away all those photos. This is the only photo that survived. Oh..... I wish I could have a chat with my 17 year old self. At the very least, I wish I could have all those photos back. This photo was taken in probably 1984. My hair looked roughly the same as Jennifer's at that time except that I had some canary yellow bangs as an unfortunate result of an encounter with a bottle of Sun In. Jennifer stayed home my first year of college, but thereafter I had her in every apartment I lived in. I made a major move in 1996 and left her in the care of my BFF who still won't tell me exactly what happened to her, but I fear the worst. Thanks for nothing BFF! Click on the images if you'd like to see larger versions. You can also see two more photos here and here. There you have it. Thanks for indulging me. My husband and his brothers had a trio of gorillas, in the traditional "Papa, Mama, and Baby" sizes, with Papa being about the size of a quite broad four year old child and the baby being... well, pretty much baby-sized. weird! how awkward was it carrying a mannequin around the beach? LOve this--story and photos. Jennifer looks exactly like Marylin, and would make a great couple with your male model. Jennifer reminds me of a running joke my college bf and I had. Sometime in the early 90s I got a computer that came with all that horrible clip art from the 80s. One morning at 3:00 a.m, while my bf slept, I printed out a 3"x5" of a woman in a power suit with an asymmetrical haircut sitting in an air plane looking in her Rolodex. I added the caption: "Let's see, did I schedule my meeting with the Mile High Club on the Ricki Lake Show?" I sneaked this masterpiece into his O Chem text so when he was in class the next day he would see it. For the next two years we would randomly come across it. I once found it in my winter boots! That is serious patience to wait months for me to stumble upon Ms. Mile High Club. It still cracks me up. Never has any story delighted me so. I wish I could meet Jennifer...maybe take her out for some frozen yogurt. This confession of sorts just reaffirms that you are the greatest person to ever live, and I am jealous of your entire family. Jennifer seems fabulous. You should write her memoirs. My cousins had a stuffed bear that was part of their family. They would make their mom sew him clothing & throw birthday parties for him. I loved your story and I wish you could have your Jennifer back. However, the New Guy looks stunning in the beach. That is absolutely hysterical! I love some creative prankster tricks! My prankster story is about a mink tail. I was given this little mink tail at a furrier my mom took me to when I was a kid. So it became a running joke for my sister and I to hide this furry tail in various places, like curled up in a pair of underwear in a drawer. Anyway, your art is amazing. I was really awestruck of the various body painings. Amazing! I love that your sense of humor was at full force even back then! You are so interesting and hilarious; I wish you would write your memoirs. It is so cool to find out what makes people tick, especially you! It is extremely intriguing to discover how humorous childhood pranking can become stepping stones to extraordinary art -- I smell best seller! Bonni. Thanks! I love your story about the gorillas. HurlieGurlie. Long time no hear. Glad you're back. It was awkward at first lugging a mannequin around the beach but I quickly got over that. He was a bit of a star that day on the beach. Ricki Lake Show. I can completely imagine that clip art you've described. I hope you keep that gag going forever. Mandi. You are too, too sweet. My family is crazy. Lovably crazy that is. I will have to write some more stories about my childhood. Thanks for your nice comment. Amy. I had a wedding for my cats when I was about 10. I made a wedding dress and everything. I even played the piano during the service. OK, I am crazy. Mme Meow. I had a number of bad run ins with Sun-in. I never learned my lesson though. I was trying to do a John Taylor/ Duran Duran dye job with a blond streak right in the center. I would put on a shower cap and pull a bit of bangs out and spray away. I'll try and find some old photos. Thanks for your sweet message. Missy. I think playing pranks is a great way to pass the time. I do. Thanks for your nice comments about my body painting. I plan on doing more of that, that is if my bf will sit still long enough. Nicki. Thanks! I appreciate your comment. Jenny. I wish I could give you the biggest squeeze this morning. Thank you for all your amazingly supportive comments. You rule! K, so I'm a lurker, but I HAD HAD HAD to post this time. I love this story and I love the beach pics. I think the greatest artists are a bit eccentric, its what makes you wonderful at what you do! I can't wait to hear more! I wonder what would have happened if Jennifer and Art got together? Yes, I named your male manny. Art. Great story and thank God you turned out so talented and not a guy in the basement sewing skin on me! I also tried Sun In and I wasn't one of the lucky ones. I was left with a tangerine-ish haze. Jennifer looks very fetching -- every detail is beautiful. I think Nina Garcia would say her make-up is flawless and the look is impecable! I love reading your stories and I am always in awe over your sketches! Keep them coming please, they really make my day! Loved loved this story. I was cracking up just thinking about your sister screaming. I love to hear about pratical jokes that brothers and sisters play on each other. Me being an only child didn't get to expierence those times. So please tell more and more!! Manns are creepy, but the artwork is great! I had a mannequin too!! I sure do miss her. I'd dress her up all the time. I painted alot of wigheads too (I was bored as a child). What's the new Man-nequin's name? Re-reading this entry reminded me of when I was little... my dad made this weird stool where the top had a Green Bay Packers logo and the bottom was legs wearing green jeans and black shoes. He somehow stumbled upon a frightening mannequin head and put it on the stool. I used to be so scared of that thing...he would move it randomly and I used to think it walked on its own and was following me around. I eventually came to love it. Your family and I probably have something in common hahaha. Oh, David.... you are simulataneously a mess (I say this with love, seriously!) and amazing. Such a great story -- sadly, its the highlight of my day! I think we are same age - I can always relate to your point of view. I love you, just absolutely adore everything you share about yourself as well as your very unique artwork. You are a true individual, please do not ever change!!! wow, your mannequin looks amazing. I have a mannequin in my apartment, but unfortunately it has a weird plastic texture that I can't draw on. when I worked at the mall I tried to steal a mannequin but it was too heavy and cumbersome to slip away with. anyways, I think mannequins are great, they're like human-shaped canvas to display your ideas on. I loved the story and the art work. We all have little fascinations and I am glad you were able to find yours. I can't wait for you to watch Real Housewives of Big Apple. These ladies are UGLY on the inside and out. For some reason, they are not at all endearing as the OC gals are. The "Countess Luann" is shown SCOLDING a friend in next weeks episode for introdicing her to a "DRIVER" as "Luann" and not "MRS." Pretentious BIOTCH. She needs to get over herself and FAST!! The world would be a better place without people like her!!! When I saw the mannequin photo I thought WOW who is that hot chiseled man? Glad he really was chiseled. I used to dress my dog up as Jayne Mansfield. Put that on your random-o-meter. Anyway the dog was a dachshund poodle cocker mix I would put her in a small t-shirt and enhance her breast (where they'd be on a human btw not a dog) and draped a piece of fur around her neck like it was a mink. Needless to say she didn't look anything like Jayne Mansfield but I looked like a big flaming homo and my parents were kind enough to take and keep photos of the evidence. 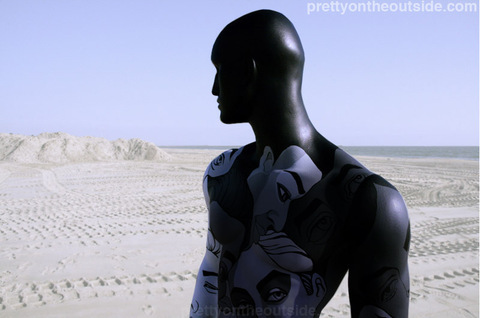 Love your male mannequin on the beach, that is about 6 different kinds of awesome. 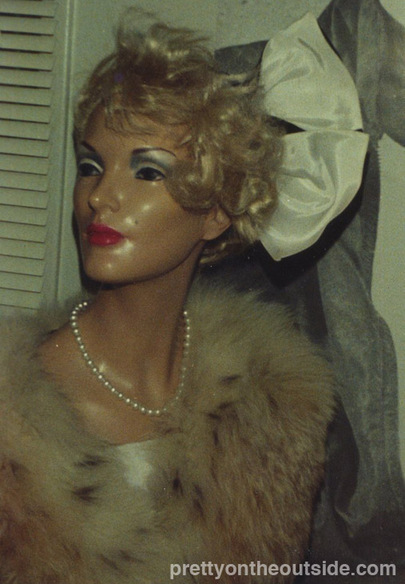 When I was a little girl my Grandparent's had a mannequin in their basement. That thing scared the living hell out of me and to this day I am freaked OUT by the headless ones in the mall! David, you're not crazy. You're eccentric. It's entirely NOT the same thing, trust me. Eccentrics just do their own thing regardless of social conventions and generally have fun doing it. Crazy people are... well, they get locked up involuntarily and have to have conservatorships placed so they don't get preyed on by random weirdos. Not that I'm thinking of anyone in particular, of course. I loved, loved, loved your Jennifer story and thank you for sharing it! If we could time travel, you and I would be partners in crime and spend all day in school thinking of different ways to display Jennifer! In fact, I may do something along those lines for Halloween! I got the biggest kick out of reading about you and her adventures and will get my friends to do something simular out of respect to you! THANK YOU!!! I'm in awe!!! Umm. My mannequin (one of those non-poseable, stylized, white plastic 80's deco ones from the Limited) is sitting on a chair in my living room dressed in an antique kimono, a battered straw cowboy hat with some dried thistle heads and random bird feathers in it, and, as pig tails, some clip-on waist length hairpieces from the drugstore. I keep my guitar on her lap and refer to her as the "future ghost of Emmy Lou Harris". I put her out on the front step last Halloween, but had to add some double stick tape to her outfit as a neighbor complained about kimono-slippage.